I have downloaded this for my modpack. But when I used it on the server it crashed the user. 31.05 15:36:05 [Server] WARN Failed to handle packet for "IP"
SPOILERS OF A YOUTUBE UNDERTALE ANIMATION! SHUT THE F*** UP SANS! Please update this to 1.8.9 It is amazing! 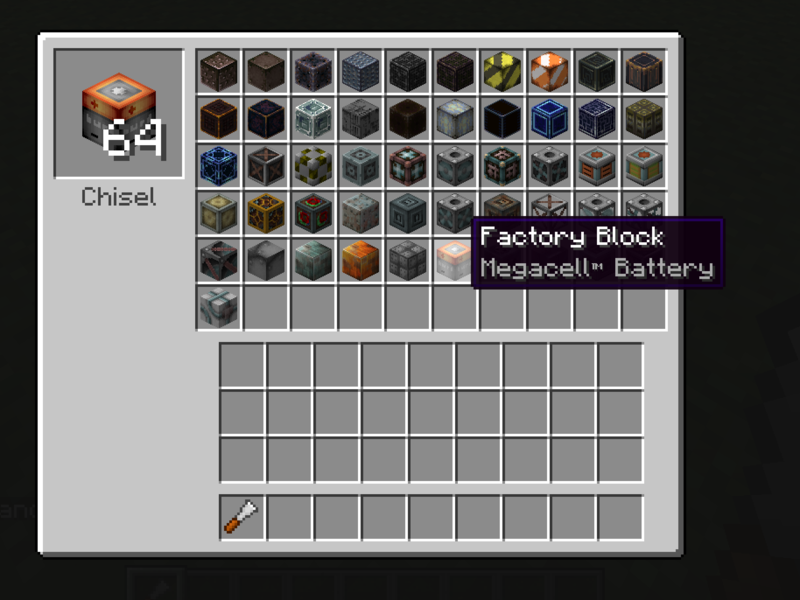 btw could you add chisels to coal block? May I please have permission to use this mod in my modpack? however you are animating your blocks( i am assuming you are overlaying the textures in some way[such as with waterstone or lava stone]) it causes those blocks to have visual glitches on many machines(i have tested it on 3) were they are there one minute and not there sometimes when anything updates the chunk such as a door. it aslso has other problems with other mods such as any mod that allows you to chisel blocks into pieces to use in sculpures(ei little blocks, little tiles, terrafirmacrafts chisel or ye gammels chisel)(it appears to be a multipart incompatability with your rendering code) your textures render as invisable, crash the game and/ or eat the memory and crash the level. they also, come out as a darker texture than they are supposed to when useing forge multiparts saw tool to saw it. please change how you are rendering block or explain why your blocks are rendered the way they are.